USER SCORE:96%The percentage of users who liked this based on high quality reviews from sources such as Google Play, iTunes, and Amazon Music. Above 75% is green. ? Too good to get lost in the shuffle. A work that explores Hussle’s rise and the lessons he’s learned as a self-taught, self-funded MC. Nipsey Hussle is a formidable rhymer and a bit of a strange character at times, and Victory Lap makes the best of both. It's a testament to the independent grind he employed to cultivate a dedicated fanbase. Nipsey gives us a body of work that never has a single dull moment. The production is masterful, the features are well-placed, and Nipsey raps like he just won a marathon. 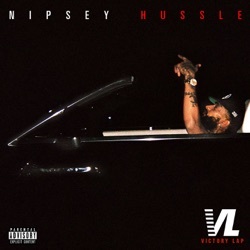 Minor potholes aside, Victory Lap not only boosts Nipsey’s stock but it raises expectations for the next time he eyes a checkered flag. Victory Lap is not just a celebration from the scrappy MC: it's a deserved moment marking his journey from Crenshaw to the majors. There is no denying how pleasantly digestible Victory Lap, despite the minor idleness. The hour-long album honors all the work he’s put in and looks back at all he’s achieved. Although there's some room for improvement, Victory Lap is still a solid effort with the promise of better to come. Perhaps Hussle isn’t quite ready for the victory lap just yet. 10 Year Marathon! This album for me is an album which I’ve been waiting on since 2008! I’ve seen this man grind hard and believe In his dreams 10 years before he reached his supposed peak. I think every track he has made he hasn’t put less than %100. Watching Nip always live through and do everything he said made me push the boundaries and with the Victory Lap comes my Victory. Nip was the inspiration which kept me going. By watching him never give up. And stay true to himself and his fans he has earned my respect as a human and seeing him persist. And never give up showed me that their is a way and if you keep running eventually you get to that finish line it’s their! Just got to keep pushing 10 Toes Down! Album of the year He was robbed, but we have to make sure his music never dies. You were robbed a Grammy R.I.P Great album from a great spirit! This is truly the best album of 2018! Just Became a Nipsey Fan last Month From the tracks i've listened to so far, I like what i've heard. I have yet to go through the whole album to give a thorough review, but I feel it will not dissappoint. By far my favorite track is, "Double Up" i get lost in that song, it takes me places.